- Enhanced Web content management, portal workflow, electronic forms integration and collaboration to help deliver improved operational efficiency and productivity. - Powerful new tools and application templates, enabling the quick building of business services and applications that help accelerate application and content deployment, which innovatively deliver on the promise of a service oriented architecture (SOA). - A responsive and reliable portal platform from a leader in the enterprise portal market. - Planning for deployment with an overview of several typical deployment scenarios. - High-availability deployment strategies by installing IBM WebSphere Portal V6.0 in a clustered deployment/Network Deployment configuration. - Configuring WebSphere Portal Version 6 to support multiple different LDAP directories. - Considerations and implementation details for configuring Portal to share data between different database domains. 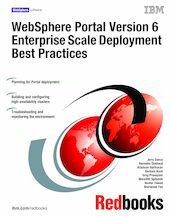 - Strategies for tuning and testing your WebSphere Portal 6 environment. - Configuration Management—procedures necessary to move your WebSphere Portal environment through pre-production release phases and deploy into the Production environment. - Best practice approaches to problem determination and troubleshooting. - Available tools for deployment automation, reducing the manual steps required by the portal server installation and configuration process. - Discussion of how to use the IBM WebSphere Portal update installer application to install interim or cumulative fixes and fix packs in WebSphere Portal Version 6.0. - A discussion of Services Oriented Architecture (SOA) and what this means within the context of Portal.